When we think of bird nests, we typically imagine a simple cup made of twigs and branches, nestled in the crook of a tree. 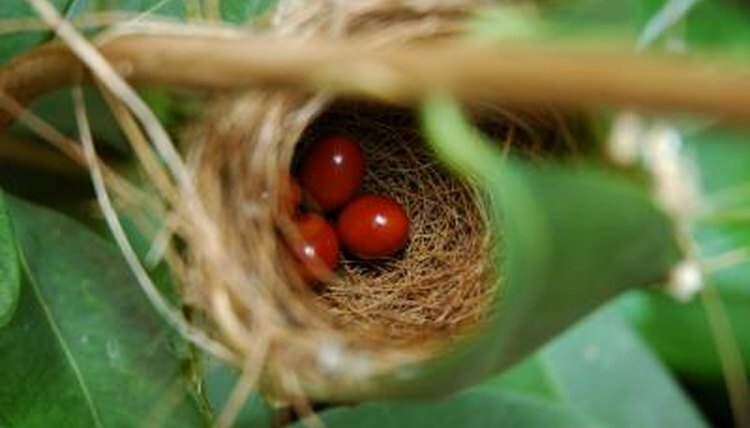 While many birds do craft nests like this, others create other kinds. Some birds craft elaborate, pendulous homes for their young, while others simply lay their eggs directly on the ground. No matter the appearance of a nest, all serve the same purpose of protecting eggs and young birds from the elements and potential predators. Many birds do not build traditional “nests” at all, but rather create a small depression in the ground or in leaf litter in which they lay their eggs. These nests, referred to as scrape nests, are typical of many shorebirds (like gulls and terns), penguins, ducks, pheasants and some vultures. Other birds, like some species of raptors and owls, also nest on the ground, but do not create a depression. These birds just seek out a secluded place and lay their eggs on the ground. Birds like burrowing owls, kingfishers, bank swallows and puffins build their nests in burrows. This provides two advantages: protection from the elements and predators, and a consistent temperature for eggs and hatchlings. Birds who build burrow nests will often construct their own, but some species (like the burrowing owl) will use preexisting burrows to rear their young. Like burrows, cavities in trees provide excellent protection. Birds who build cavity nests—like woodpeckers, parrots, bluebirds and many species of owls—make use of holes in trees or hollow out their own. These cavities allow birds to efficiently heat their eggs and can provide a sturdy shelter in poor weather. Platform nests are most commonly used by large birds of prey, like eagles and ospreys; however, birds like egrets, herons and cormorants also make use of these large nests. Platform nests are, as the name implies, elevated and flat. They can be found in trees or on top of tall vegetation. Many platform nest builders add to their nest year after year, often making it very large. The largest bald eagle nest recorded weighed approximately 2 tons and measured 8 1/2 feet in width. Cupped nests are the traditional archetype of a nest and the most commonly used. These nests resemble a bowl or cup and can be constructed of a number of materials, from sticks and twigs to string and feathers. Most songbirds build cupped nests, as do hummingbirds, robins and some swifts. Suspended nests can resemble intricate cupped nests, but are distinguished by how they are supported. Instead of being supported from beneath, suspended nests are supported by their rims or sides. These structures can take on a host of shapes and sizes, resembling a pendant, a sphere or a suspended cup. These nests are used by birds like orioles, weavers and vireos. What Kind of Nest Do Hummingbirds Live In?